Cell phones have become such an important part of our lives. Many of us (myself included) feel out of place if we don't have our phone in our hands or on our person, and when you look around any public space (airport, waiting room, or theater) you see people engrossed in their phones. 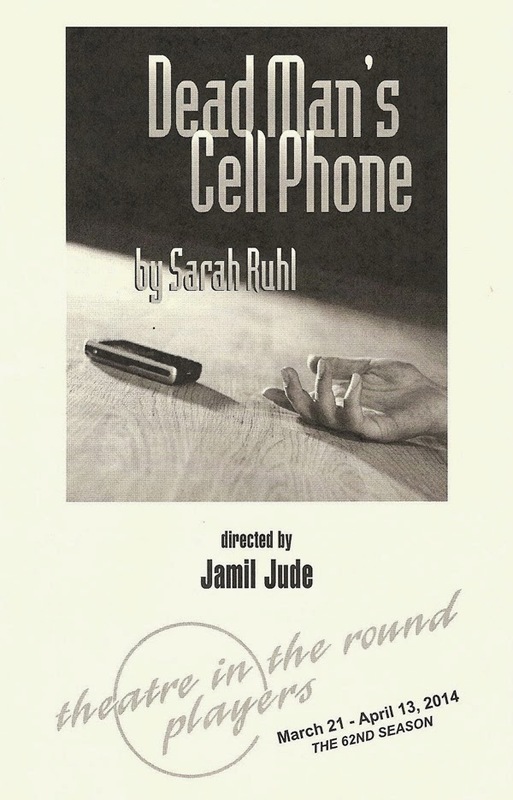 Dead Man's Cell Phone (written by Sarah Ruhl who also penned the delightful In the Next Room) is about what happens when a woman becomes obsessed, not with her own phone, but someone else's. Now playing at the oldest theater in Minneapolis (aka Theatre in the Round), it's an odd, quirky, funny, absurd little play. Jean is sitting in a cafe minding her own business when she hears a cell phone that won't stop ringing. She asks the phone's owner to please answer it, but when he doesn't respond, she answers it for him. Only then does she realize that the reason he isn't answering his phone is because he's dead. So begin's Jean's journey as she feels obliged to continue to answer this man's phone and speak to his friends, family, and business associates. She meets his mistress, his wife, his mother, and his brother, and helps them grieve their loss (although none of them seems that upset) as she finds out more about this man Gordon. When she eventually discovers the shady details of his business, she's in too deep to escape unscathed. Colleen Somerville Leeman is a great choice for the lead role of Jean. She's just so personable and relatable that you can't help but go along with her as she take us on this strange journey. Charles Numrich brings the dead man alive as we find out just what kind of person he was. Andrew Troth provides contrast to that character as the brother who's always been in his shadow, in a sweet romance with Jean. Adding humor are Jan Arford as Gordon's self-centered mother and Anna Olson as his wife, with a couple of delightfully silly turns as a drunk and a figure skater. It's always fun to see theater in Theatre in the Round because it is quite literally in the round. The audience surrounds the stage on all sides, providing many different perspectives of the show, which can be a challenge in staging. But in this show, as others I've seen, I never felt like I was at the wrong angle. The stage is bare, with a few set pieces brought on and off during scene changes, including a round table that can be cleverly separated into four pieces and put together in different ways to represent various tables (set design by Sadie Ward). During those scene changes (which are a bit long at times), light bulbs in greenish cubes provide a soft otherwordly glow (lighting design by Courtney Schmitz). Dead Man's Cell Phone is fantastical and a bit absurd, but speaks to real-world issues of love, loss, and human connection. Turn your phone off for a few hours and check it out at Theatre in the Round, playing weekends through April 13.